Mind and spirit together make up that which separates us from the rest of the animal world, that which enables a man to know the truth and that which enables him to die for the truth. Comments on: "Edith Hamilton Quotes: Mind and spirit together make up that which separates us from the rest..."
The fullness of life is in the hazards of life. To be able to be caught up into the world of thought—that is educated. The modern minds in each generation are the critics who preserve us from a petrifying world, who will not leave us to walk undisturbed in the ways of our fathers. A people’s literature is the great textbook for real knowledge of them. The writings of the day show the quality of the people as no historical reconstruction can. Theories that go counter to the facts of human nature are foredoomed. Edith Hamilton was born in Dresden, Germany. She was an American educator and author who was "recognized as the greatest woman Classicist". She was sixty-two years old when The Greek Way, her first book, was published in 1930. She had published other books, among them The Roman Way, Mythology, and The Echo of Greece. She was an educator, one of the first women to graduate from Bryn Mawr, the prestigious women's university. She eventually became head of the Bryn Mawr Preparatory School for Girls in Baltimore, a post she held for 26 years. 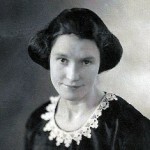 She retired in 1922 after 26 years of contributions to the school. In 1950 she received the honorary degrees of Doctor of Letters from the University of Rochester and the University of Pennsylvania.